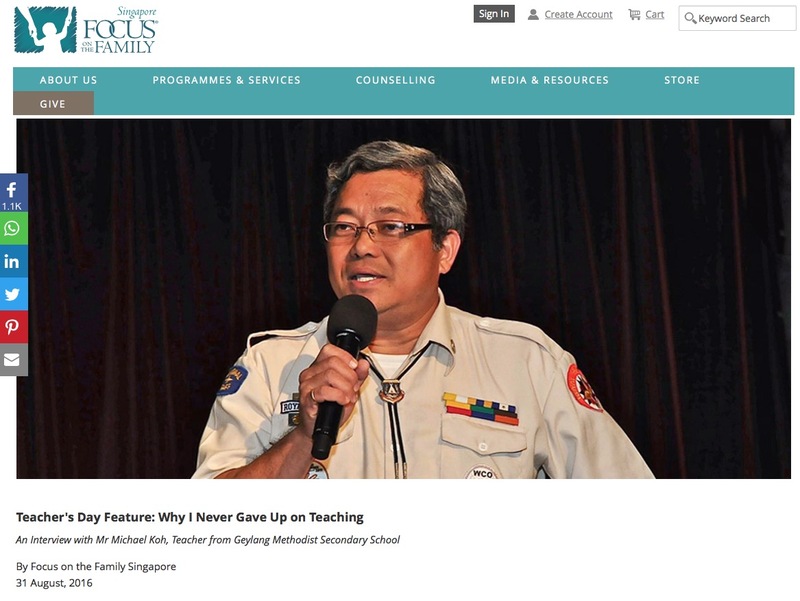 A recent article by Focus on the Family (Singapore) shares the profile of Pastor Michael Koh, Outpost #01 (Bethel A/G) on how serving in Royal Rangers motivated the desire to go into the teaching profession. Was teaching your first career/job? What were the factors that motivated you to choose teaching as a career? Yes, it is my first job. At that time, till now, I am serving in a uniform group, called the “Royal Rangers.” We run programmes for children and youth aged between 5 and 18 years old. I enjoy interacting with them, teaching them skills and organising activities to let the children enjoy the great outdoors. I guess, it was then that I was opened to consider teaching as my career. But really, it was the school posting during the course, the teaching experience, standing in front of a real class, which began my love for teaching. What do you feel is the most rewarding part about being a teacher? Lives. I value every life. There is so much potential in every child. What is rewarding is to know for a fact that in this ‘job’, I could be a part of every child’s journey. Every child that I come in contact with, I can teach, instruct, build, influence, inspire, help, love, listen to, encourage, care for and lead. There is so much I can give, and I consider this a privilege. What better way to spend my life working than with lives? What is most rewarding is to look back in time and see those times that I could be present to make a difference for a child, that my words or actions has made a difference to them. Have you ever had a defining moment where you said “yes, this is why I became a teacher”? Could you share that story with us? That defining moment came from my mentor who inspired me with the word, “Influence”. It is this word that continues to give me strength and passion in my job. I can help my students achieve academically, I can teach them how to live better lives, I can teach them to love and honour their family, I can teach them to serve their community and I can teach them to be loyal citizens. I can teach them that their lives are not just about themselves but also about the way they choose to live and love and how this will impact everyone they come in contact with. More than just teaching, I can model it, I can share my stories, I can lead them and I can show them how.